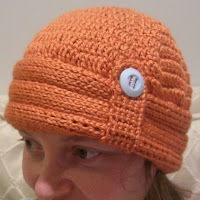 One of my hats - my knit-look crocheted cloche - may soon be making its debut on New Zealand national television. The kid show's 20-something female host is always wearing cute hats or ribbons in her hair, so I emailed them to ask if she might like to wear one of my hats. I recently got a nice reply saying they'd been looking for an orange hat to go with her outfits, but couldn't find one, so would be happy to take up my offer. If she wears it on the show, I'll post a photo and link to the show's website. I modeled it, but it doesn't suit me very well! My friend Janis has already told me, with much sarcasm, just how lovely it looks on me...though, to be fair, she absolutely detests the color orange. That is the cutest little hat; I hope she wears it!